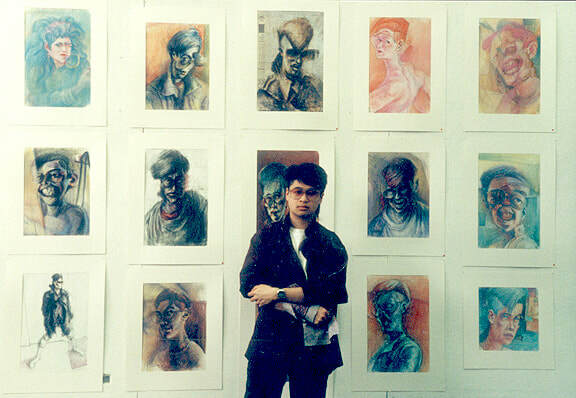 After he was diagnosed with clinical depression in 2015, Emmanuel Lopez looked back to an exhibition of his self portraits at the Ontario College of Art & Design in 1985. These "mind bending" drawings revealed and predicted a mental illness that would lead to severe adversities over the next 30 years. The silver lining was that his art and other creative tools he embraced would vastly empower Emmanuel's joy, hope and passion throughout the darkness. For over 30 years I've used my creative skills and talents to successfully cope with clinical depression and seasonal affective disorder (SAD). And it was especially life-saving during the decades I had no idea I was suffering from a mental illness. At first, about once a year, I would go through a few days of depression. These "down days" would slowly increase in frequency and duration until the symptoms lasted an entire year in 2000. I also completed two empowering weekly programs called Cognitive Behavioral Therapy (CBT) that helped me understand what I was dealing with and provided many powerful tools I use daily. Thankfully I had CBT, other therapies and my creative skills (art, graphic design, writing and music) to help transform my low moods every time my symptoms seeped into my day. These creative coping tools helped alleviate the ruminating of negativity storming my brain while fueling my indestructible optimism. I'm sharing these tools to help inspire you, a loved one or co-worker to re-ignite hope and passion in their own struggles. Here are eight examples of my creative tools for depression and motivation that I hope will inspire you to implement whenever you feel hopeless, lost or alone. I loved movies growing up! They also inspired my creativity and empowered me to be the best person I could be. But then they would help save my life during unexpected periods of depression. They helped give my brain a rest from ruminating thoughts of negativity and hopelessness. Films like Groundhog Day, The Shawshank Redemption and It's a Wonderful Life became my cinema therapy. Ultimately the movie heroes help to teach me how to activate my confidence, courage, resilience and indestructible optimism! In 2006 I began documenting the movies that motivated me in my blog called MOVIES THAT MOTIVATE: THE ADVENTURES OF MOTIVATORMAN! Drawing had always been a passion since I was a kid! And it wasn't until I was diagnosed with clinical depression in 2015 that I began to look back and see that doing art was a form of coping with periods of feeling down and hopelessness. The images I created were either very dark or amazingly joyful and full of brightness. Doing art whether for personal reasons or through my illustration business was my therapy! I've always enjoyed creative writing in school growing up and later wrote many collections of poetry and song lyrics that I later applied to songs I'd compose and record. Writing then became joyfully cathartic when I started to write my MOVIES THAT MOTIVATE blog that was my online diary. No matter how I was feeling, and especially when I felt depression symptoms, I would get out of bed twice a week and wrote my latest post. Each article was like a sculpture to chisel away at until the final edit. They were like little works of art that I could share instantly with my readers and fans around the world. I find writing to be very therapeutic and they always give me a sense of joy to produce! When I was a kid I remember getting my first camera and was so passionately addicted to taking photos! That passion continued into my teens as I became editor-in-chief of photography for my high school yearbook two years in a row. Later digital cameras were so exciting because it no longer required film rolls and were immediately downloadable! And then my life truly changed when I got my first iPhone. I now photograph constantly and love doing special events, family gatherings or even joyful images I see doing my daily therapeutic walks. When I discovered Instagram I really fell in love because I could post my photos and write little stories to add to them. I loved the sense of community on this social media tool! I'd often be amazed how productive, focused and enthusiastic I feel when writing and posting my photos during periods of depression. My passion for photos truly eliminates the ruminating of negativity and hopelessness that can occur. I always had a dream of writing and performing songs growing up and the financial success of my illustration business allowed me to invest in keyboards, synthesizers and recording equipment in the early 90's. My first recording tool was the Fostex 280 which basically split a cassette tape into four paths to record on. Technically it was better then what The Beatles used in the 60's and I absolutely loved composing! In 1990 I recorded one of my best songs on this 4 track recorder called "In the Film" which I only realized 25 years later that it was a form of therapy to help cope with depression at the time. Years later in 1999 I'd record my first CD album called Rain of Angels in which the title track also reveals a depressive state I was in at the time. In the end these songs, and many others, have lyrics that were uplifting and full of hope. I still listen to them today and they always feel like a warm blanket comforting me during dark times. As a teen I loved making Super 8 movies and later in life was so excited to discover the creative power of iMovie on my Mac! It opened up a whole new way of storytelling for me as well as a fantastic easy-to-use creative coping tool for depression. I began making fun little videos using my photos, artwork and music and then short promotionals for my motivational speaking services. I am always in a state of joy whenever I shoot video or editing them into an engaging little movie! After I was diagnosed with clinical depression and antidepressants were ineffective for me, I felt my gut telling me that I could solve this through therapy and diet (pun intended!). Since then I've been passionately researching different diets and learning to cook! And since I am also passionate about photography and storytelling I began photographing the delicious foods and meals I've been preparing. I am currently exploring a high alkaline diet that is plant-based and you can follow my food journey on Instagram. Find a Creative Tool That Works For You! These creative coping tools are just examples to help you, a loved one or co-worker find coping solutions for managing mental illness challenges. Whenever I engage in any of these creative tools, I always feel a deep sense of blissful focus and joy. I am truly in the moment and no longer ruminating on the past or worrying about the future. Solutions to any problem always flow while in this positive mental state! This is a feeling of empowerment I know anyone can experience when they find a creative tool they truly enjoy. Find a creative tool that works for you today and discover how they can help increase your enthusiasm, resilience and activate your indestructible optimism! For His Motivational Speaker Services!